I’m a sucker for re-purchasing the games that I loved as a youth, even if I still have physical copies of them. I’m such a sucker in this regard, in fact, that I have purchased Final Fantasy VII, Final Fantasy Tactics, and Streets of Rage 2 no fewer than three times each. When I know that I love a game through and through, when I know that I’d be happy to play it any time, any place, when it goes on sale, I can’t help but splurge, because I know exactly what I’m going to get. Except sometimes, the games surprise me, especially the games I pick up again after leaving them on the shelf for years and years at a time without thinking of them. Sometimes I pick them up again and see them in a different light than I did when I was a youth. I recently got myself a PS3, figuring that we were at the end of a console generation and the time would never be better to catch up on all the Sony exclusives I’d missed out on for the last seven years (that Nathan Drake! What a card!). Not having much to play on it after I’d gorged myself on FFX/FFX-2 HD, I installed the PSOne Classics that I’d bought over the years to play on my PSP and fooled around with those. I loaded up JetMoto, played it for a while, and had a realization. JetMoto has a more progressive stance on gender than an awful lot of games. The game has a playable cast of twenty riders (subdivided into four different “teams,” identified by brand, in what might be the most ham-fisted case of product placement in a game from its era), and of these twenty riders, nine of them are women. It’s not complete 1:1 parity, but it’s pretty close! It’s a nice touch, too, that the default rider the “character select” screen starts on is a woman–and she also happens to be the character on the title screen. The graphical limitations of the system mean that JetMoto doesn’t mess around with individuated character models for different riders–with some slight differences in size, all “Butterfinger” riders look alike, as do all “Mountain Dew” riders–and so all of the riders, male and female, appear the same during races, clad in their motocross-esque jackets and helmets. Fittingly, the characters on the title screen are also girded in this “X-treme sports” gear, but a second glance at the character front and center reveals it to be obviously Dakota–her long black hair and feathered accessory marking her distinctly. The game is obviously about the vehicles and not the riders–but it’s a nice touch that the “face” of JetMoto, at least by default, is a woman. The riders you can choose from aren’t terribly distinct from each other, and they’re only defined by a handful of assets–a portrait on the character select screen, a paragraph of backstory, and a full-body portrait which is displayed in the winner’s circle if you happen to place first–but these are enough to offer each of the riders at least a little bit of personality. And while it’s true that a couple of the ladies in the roster are partly defined by their relationship to male riders, the flavor text often seems to suggest that they’re in a better position than their counterparts. Shannara, for example, is the ex-wife of one of the male riders–we’re told that she races on a modified bike that she won in her divorce settlement, a machine built for someone twice her weight. Her ex-husband, by contrast, is a man whose “spirit sank with his ranking, harsh bitterness [reducing] him to little more than a hired gun to run opponents off-track.” Shannara’s stats are considerably better than those of her ex. “Quick Jessie” West is introduced as the protege of Mark “The Max” Corri, and we’re told that her biggest hurdle to an impressive debut season may be having to compete against her mentor, but The Max’s profile likewise mentions that the biggest threat he faces “this season” probably comes from Quick Jessie. The other women in the line-up are defined by their own merits–at least, to the extent a character can be in three or four sentences. Shirow is “the first female Japanese heavy bike rider,” and it’s rumored that she has cybernetic enhancements. Irons grew up in the rodeo. Harris is a bungee-jumping, skydiving adrenaline junkie. “Bomber” is a mechanic who builds the fastest, heaviest bikes in the whole circuit. It probably doesn’t mean a lot, in the grand scheme of things, that there are so many different female racers in a hoverbike game from 1996. But I spent an awful lot of time playing JetMoto when I was twelve, and I can’t help but think it had an effect on me. At the very least, the uniformity of character models in-game means that JetMoto doesn’t overtly sexualize its racers. That’s a pretty low bar to set for a game, especially a sci-fi motocross game, but this is 1996 and we have to start somewhere. 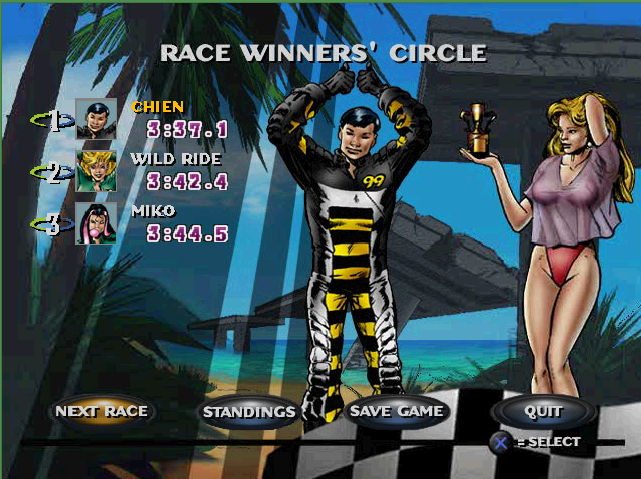 There ARE girls in skimpy outfits in JetMoto, it’s true: if you come in first place in a race as a male rider, part of your reward in the winner’s circle is having the trophy presented to you by a woman in a skimpy outfit (a bikini, Daisy Dukes, etc.). Conversely, however, if you’re playing as a female rider, the trophy is handed to you by a beefcake dude in hot pants. The game has ogling, yes, but it’s equal-opportunity ogling. For whatever that’s worth. This “trophy babe/trophy hunk” feature of the game is also the source of one of the subtlest, most delightful twists in JetMoto‘s sneakily diverse presentation. While it’s possible to set the game to always display a male or female trophy presenter in the game’s options menu, the default setting is “Rider’s Choice.” The wording here, I think, is key, because by invoking the characters’ preferences, the game is allowed, without much fanfare, to suggest that two of its twenty riders are gay. Is this the ideal handling of a diverse and balanced approached to gender, race, and sexuality? Of course not. But for 1996, it’s almost certainly more progressive and forward-thinking than you’d expect: a nearly 50/50 split of men and women, a fair modicum of ethnic diversity (African-American, Native American, Asian, African… Australian), and a subtle acknowledgement that 10% of its rider pool is gay. I get game music stuck in my head all the time. Surely I’m not alone in this. There is a substantial portion of the game playing community that’s wholly invested in game music. Check out OCRemix if you’re in any doubt. For my part, game music has the ability to make me nostalgic for places that are entirely fictional– while movie scores, upon listening, can bring me immediately back into the story with which they originate, game scores have the additional quality of making me want to go back and roam the worlds they come from. I don’t just miss the characters, the emotional moments, the great battles… I miss the towns, the countries, even the dungeons. Probably the most evocative music I can think of in this regard is Nobuo Uematsu’s scores from the Final Fantasy games. This one, from the closing credits of FFIX, makes me wistful for my travels through the streets of the bustling city of Alexandria, the bizarre landscape of the Forgotten Continent, and the strange otherworlds one traverses in the latter parts of the game. If you haven’t played the game before, of course, it will have none of these connotations… Nevertheless, Uematsu’s music has a certain universal applicability to light fantasy. Perhaps this will remind you, too, of a story you loved when you were small! Any memories come wafting out of the past?